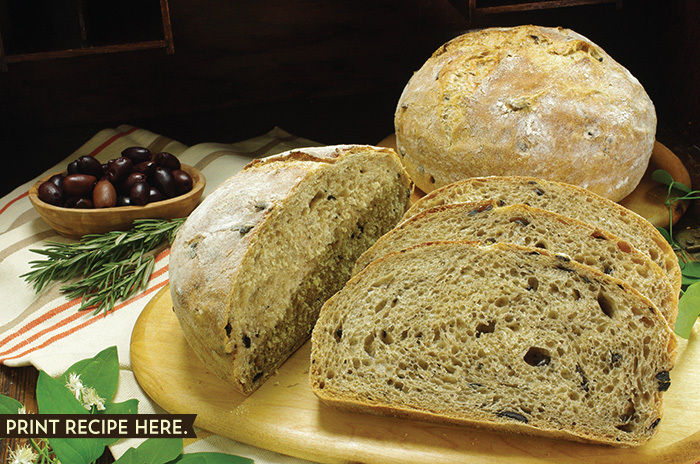 If only I had a quarter for every time I heard someone say, “Oh my god, olive bread is my favorite!” Olive bread seems to really strike a chord with folks, and this is the best recipe I’ve ever found. It’s inspired by the world-renowned Tartine Bakery, here in San Francisco. They like to use an herb mixture (herbes de Provence), while I just opt for food, old-fashioned rosemary. Do what you will; the olives and lemon zest, together with whatever herbs you choose, will get you invited to every dinner party in town. Just so ya know, for up to 2 loaves, 1 lemon will do, but for 4 loaves you’ll need 2 lemons. 3. Let it ferment. Cover bowl with a plate or plastic wrap, and put it in a cool place (55 to 65°F/13 to 18°C) for about 12 hours. 4. 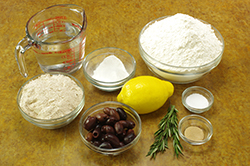 Prepare the olives, lemon zest, and rosemary. I like to use kalamata olives, but you can use whatever kind you like, so long as they don’t have pits in them. 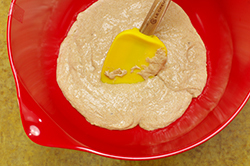 About 1/3 cup/45 g will do for one loaf of bread. 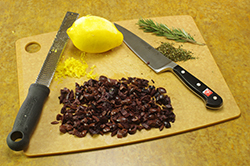 Coarsely chop the olives with a sharp knife. Use a zester to get the zest of about half of a medium-sized lemon; you should have about 1/2 tsp, firmly packed, for each loaf. Mince some fresh rosemary. 6. Let the magic happen. 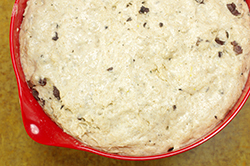 Cover the bowl and let it sit until the dough has about doubled in volume. 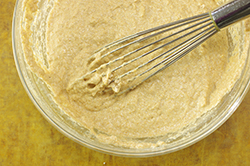 Rise at room temperature for 3 hours, then in the fridge for at least 3 hours or up to 4 days. 7. Shape your loaf. 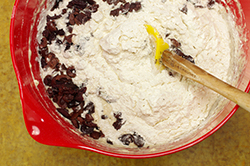 After the dough has completed its bulk rise, flour your counter and pour the dough out. 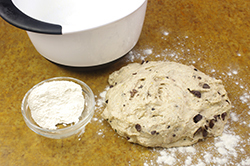 Gently fold a corner up and over into the middle, and repeat around the entire piece of dough. Flip your loaf so that it’s seam-side down while you prepare your proofing basket. 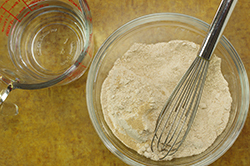 Dust your proofing cloth with rice flour, line the proofing basket with the cloth, and use a spatula or bench knife to plop the loaf into the basket, seam-side up. 8. Let your loaf rise. Do what’s convenient for you, either letting the loaf sit out on the counter or sticking it in the fridge. 9. Preheat your oven. Once your loaf has risen, put your baking stone or Dutch oven on the middle rack of your oven and preheat at 475°F/240°C for 45 minutes. 10. Bake your bread. 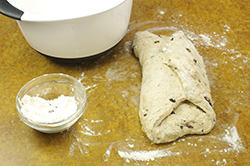 Sprinkle the loaf with cornmeal (or cover with parchment paper) and invert the proofing basket onto the large plate or pizza peel. 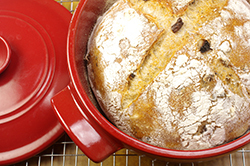 (Or, carefully plop the loaf into your preheated Dutch oven, omitting the parchment.) Slash the top with the razor, get it into the oven, and cover it with a pot or bowl (or put the lid on the Dutch oven). 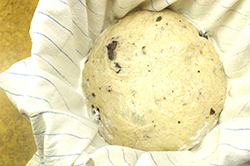 Bake for 20 minutes, uncover, and remove the parchment. 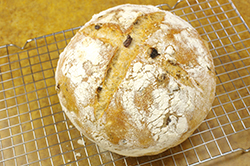 Bake for another 15 minutes, and check the bread to see how it’s looking. If it’s not dark brown, give it another 5 to 10 minutes. 11. 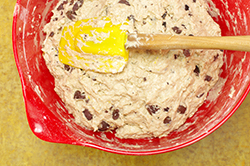 Once it’s done, let it cool on a cooling rack, or lean it against something so the air can move around it. Then surprise your neighbor with your new, hot loaf.